Get a full suite of input controls with built-in masking, formatting, parsing, and validating capabilities with ComponentOne Input™ for WinForms. With this rich suite of 11 separate controls, you can manage dataset navigation, create specialized drop-downs, and more. Button is a standard button control which supports additional visual styles. DateEdit, NumericEdit, and DropDownControl feature an additional, optional modal button which is useful for launching a special dialog box or any other custom action. SplitButton is a standalone split button control that began as part of Ribbon. CheckBox supports data binding to Booleans, Strings and Integers. It also supports borders and visual styles. DbNavigator provides buttons for convenient data source navigation. It enables record navigation and common data actions like update, add new, delete, apply, cancel, and refresh. DateEditor, a flexible date input control that displays the CalendarView control in a dropdown, enables faster date input and selection. DropDownControl also derives from TextBox and gives you complete control to create your own drop-down editors. Attach your own logic to the spin buttons and your own form/editor to the drop-down button. Easily create custom drop-down editors in the Visual Studio designer just like any form. ComboBox provides developers a portable, lightweight ComboBox control that combines the versatility of an editable textbox and the power of an auto-searchable drop-down box. ComboBox supports partial search support. 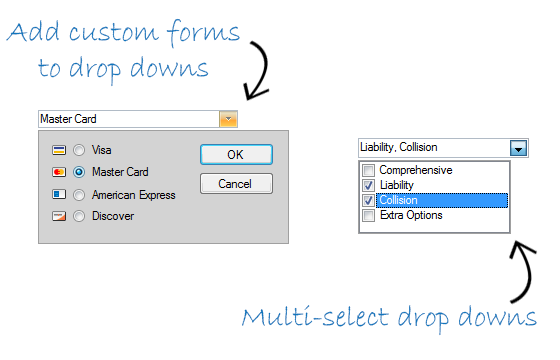 To create your own custom drop-down editor, use the DropDownControl. It allows you to create any drop-down editor you need. Drop-down editors are created visually as forms in your project. The NumericEdit control contains a drop-down calculator. It follows the standard Windows calculator model, allowing the user to perform calculations without leaving the control. The calculator is optional, and supports visual styles and UI strings with localization. Label and PictureBox provide data binding for read-only data and images. TextBox is an all-purpose, data bound input control used for entering and editing text-based information. It includes special masking, parsing, validation, and formatting features useful for all common data types. Input for WinForms controls support masked input when you set the EditMask property to a mask string. Masking is useful for formatting special input values such as telephone numbers and zip codes. You have the flexibility to define your own placeholders and easily obtain the input value with or without literals and placeholders. The RangeSlider control extends the basic slider control and provides two thumb elements instead of one, allowing users to select ranges instead of single values. Input for WinForms includes over 30 built-in format types, including Currency, Percent, Scientific, Hexadecimal, YesNo, GeneralDate, and more. You can easily specify the formatting method by setting just one property, FormatType. Most Input for WinForms controls provide a typed Value property that is specifically designed to be data bound and supports automatic typing determined by the data field. Specify validation rules without having to handle coded events using Input for WinForms controls' pre and post-validation property settings. Pre-validation allows you to check raw input text, while post-validation enables to verify that the value falls within certain criteria. Validate values against an exact list of allowed or excluded values, use wild card string patterns, regular expressions, or simply fire a validation event and handle this yourself. Data parsing is converting strings entered by the user to the data type representation (the opposite of data formatting). Input for WinForms controls provide properties and events which enable you to fine-tune different aspects of parsing. All Input for WinForms controls support visual styles, including Office 2010 and 2013 styles. (Office 2016 themes will be available by end of 2017). Provide a modern and consistent look to your application by using the styled Button and Label controls along with other ComponentOne WinForms controls. Input for WinForms controls contain a Culture property which allows you to customize the culture at the control level. You can configure many additional regional settings such as calendar information for DateTime input, and special characters such as the decimal point. Detect errors while parsing or validating input values with ease. 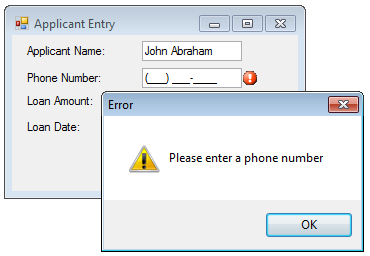 Input for WinForms controls have an ErrorInfo property which allows you to customize the error handling. For example, alert users with a beep, prevent them from putting focus to another control, display an error message, or reset the value. Input for WinForms controls provide flexible rules for handling NULL (DBNull) and empty values. You can display specific text for null values using the NullText property and allow the user to enter null values in several different ways.